In 1999, at age 89, artist, author, illustrator Esphyr Slobodkina designed a mini museum at what would come to be known as the Slobodkina House (2000-2012) in Glen Head, Long Island, NY. The Slobodkina House was a place where guests could visit and view more than 200 works of art, Slobodkina’s handmade dolls and jewelry, as well as her complete collection of children’s storybooks, including some original illustrations. Also available for viewing were the beautiful polychrome designs on silk, Slobodkina’s collection of artifacts, letters, and memoirs from her travels and shopping expeditions and a smattering of favorite pieces by other artists that Slobodkina treasured. In the year 2000, Esphyr Slobodkina formed the Slobodkina Foundation, a 501(c)(3) non-profit company. The Foundation consisted of 11 board members, and the Slobodkina House & museum functioned under Slobodkina’s direction as President until 2003. In 2003, the Board of Directors elected Ann Marie Sayer, Slobodkina’s executive director and seven-year companion, as president of the Slobodkina Foundation. The Slobodkina House continued functioning as a museum and exhibition facility until December 2011. During these years, programs for children, adults, scholars, and seniors were offered at the facility, as well as outreach programs throughout the tristate region and Connecticut. Slobodkina’s sister, Tamara Schildkraut, who resided at Slobodkina House, worked with the president, Sayer, and her assistant, Karen Cantor Paul, building exhibitions of Slobodkina’s fine art and children’s books until just before her death at age 104. In 2012, due to financial stresses, the Slobodkina Board of Directors sold the building in Glen Head to enable the Foundation to continue its mission. Today, the charitable Slobodkina Foundation actively preserves the legacy of Slobodkina’s prolific, unusually multifaceted career through traveling exhibitions, programs for children of all ages, and an online presence. The Slobodkina’s Foundation is once again thriving. From 2008 through 2010, the Slobodkina Foundation, in association with the Heckscher Museum, presented an exhibition of the largest collection of Esphyr Slobodkina’s art, which traveled to museums in the United States. In 2011, President Sayer began work on a sequel to Slobodkina’s classic book Caps for Sale. The book, More Caps for Sale, was published by Harper Collins in 2015 and has helped to bring financial stability to the Slobodkina Foundation. In fall of 2016, a tour of Slobodkina’s entitled: Caps for Sale & Other Tales: The Art & History of a Storybook and its Maker traveled from New York to North Miami Florida for a 14-week exhibition with a focus on collage and Slobodkina’s children’s book illustrations. The exhibition won both regional and Florida State awards. 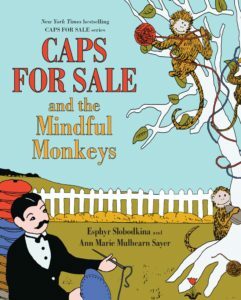 A third book in the Caps for Sale series, Caps for Sale and the Mindful Monkeys, was published in spring of 2017 by Harper Collins. The Slobodkina Foundation provides children’s literacy activities, discussion groups, interactive performances to school groups, senior organizations, and community groups. These objectives are achieved by fully utilizing the fine art, illustrations, and decorative works of Esphyr Slobodkina, created throughout nine decades. The Slobodkina Foundation is a 501(c)(3) non-profit organization. Slobodkina’s art is stored in a climate controlled facility when it is not touring.